There's no denying the attractive look of the Titleist Bullseye Flange. The soft lines and curved ends of this putter are simple, soft and classical. You feel like you're using an elegant piece of workmanship. The bullseye range is based on the now ancient Golden Goose Putters which were THE putters of the 1950s and 60s. The Flange model has an extra rounded back side which looks good when you're looking down at it. The feedback you get from the Bullseye Flange is superb. 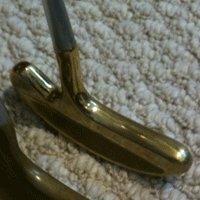 There's a pureness to the strike of such a simple putter that can't be rivalled by most modern putters, especially heel and toe putters which deaden the feel of the strike because of their larger and less concentrated sweetspot. But how often are most of us are going to strike that tiny sweetspot? That is a slight problem! The truth is that most golfers simply aren't good enough to experience this deliriously good feel any more than occasionally. When you strike a Bullseye well - and I really do have to stress the word "when" - you'll find you get a beautiful roll on any green. This model is certainly lighter than most modern putters and in that respect it gives you real confidence on superfast greens, where a heavier putter would be too clumsy. However, both the feel and the roll come with a major reservation. This putter is seriously difficult to strike consistently well compared with modern heel and toe weighted putters, so I would really only recommend the Bullseye Flange for you if you have a consistently accurate stroke. A beautiful putter to look at and to use if your stroke is good enough! Not sure that a Bullseye Flange is right for you? Click here for our guide to choosing the right putter for your stroke.